The dental office of Eric H. Francis, D.D.S., P.C. held its grand opening for their new location at 394 Broadway in Newburgh on Thursday, July 9, 2015. 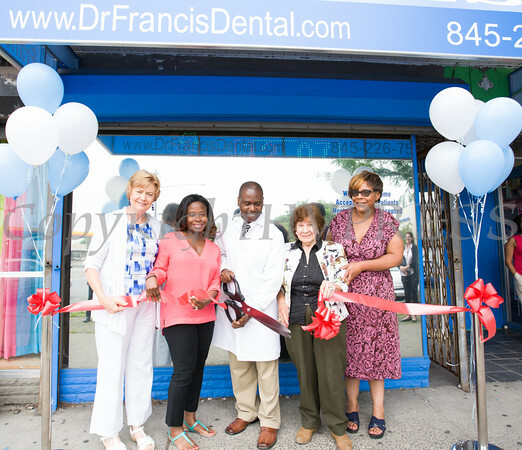 Mayor Judy Kennedy, Arizah Francis, Dr. Eric Francis, Deputy Mayor Regina Angelo and Councilwoman Cindy Holmes (Ward 4) cut the ribbon for the dental office of Eric H. Francis, D.D.S., P.C. during the grand opening for their new location at 394 Broadway in Newburgh on Thursday, July 9, 2015. Hudson Valley Press/CHUCK STEWART, JR.